REV’s Malik Lovette celebrates the CIF-SS Title victory on Dec. 5 against Riverside Poly. 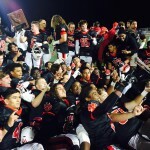 Head coach Kurt Bruich and the Redlands East Valley Wildcats (13-1) were named to the CIF Division II South State Championship Game against the Bakersfield Ridgeview Wolf Pack (12-1). 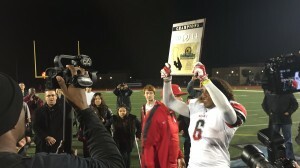 The game will be held at 7:30 p.m. Dec. 13 on the campus of Citrus Valley High School. 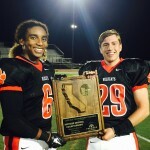 The Wildcats handed Riverside Poly High, it’s first loss of the season to win the 2014 CIF-SS Inland Division Championship on Dec. 5. 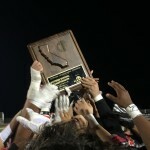 The Wolf Pack defeated Dinuba High, 16-14, to win the CIF Central Section Divsion II Championship.